The Ministry of Finance has signed an agreement with EESL for the deployment of 15 Mahindra e-Verito electric vehicles for their officers, along with 28 charging points at the North Block. The Department of Economic Affairs, Ministry of Finance has signed an agreement with Energy Efficiency Services Limited (EESL) for the deployment of 15 electric vehicles for their officers. 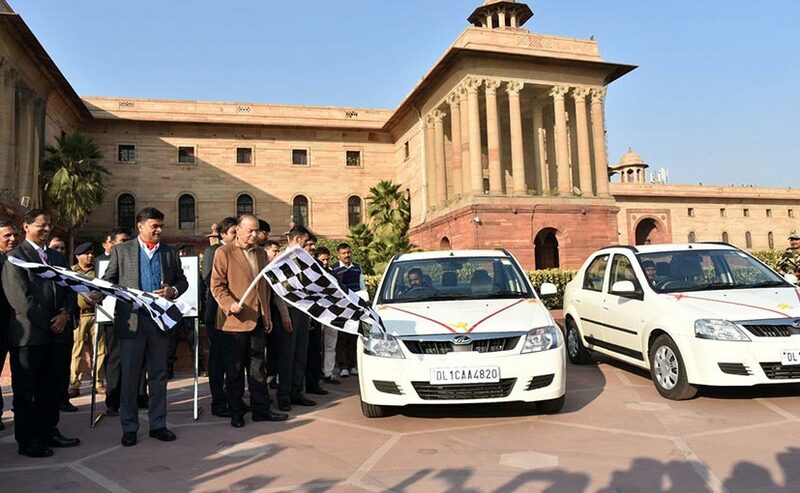 The electric cars handed over by EESL to the Finance Ministry include the Mahindra e-Veritos. EESL also sources the Tata Tigor EVs that that are used in the government fleet. 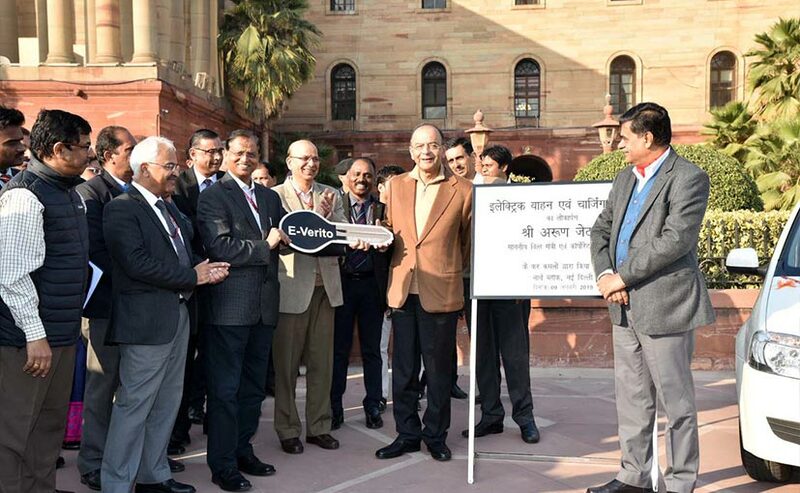 In addition to the 15 electric vehicles, the government also set-up 28 electric vehicle charging points that include 24 slow charging points and four fast charging points at the North Block. With 15 EVs in its fleet, the government said that the Department of Economic Affairs is expected to save 36,000 litres of fuel every year, and will reduce over 440 tonnes of CO2 emissions annually. Speaking on the occasion, the Union Minister of Finance and Corporate Affairs, Arun Jaitley said, "Electric mobility, is an attractive, sustainable and profitable solution to mitigate the climate change and to reduce the risk posed by vehicular emission to public health. EVs have the potential to support India's growth by enhancing manufacturing, job creation, and technical capabilities. We are glad to be a part of India's mission of rapid adoption of e-mobility." Union Minister of State (IC) for Power and New & Renewable Energy, RK Singh said, "The Indian Government is committed to usher in an era of clean, green and future-oriented technologies in the country. Today, we have achieved yet another milestone in that direction. The Government is promoting e-mobility by taking a lead in changing the fleet of cars used for official purposes with electric cars and at the same time creating the right policy framework enabling this ecosystem and to support its adoption." The Indian government aims to switch to electric vehicles in its fleet by 2030 and this is a step in the same direction. In addition, the Department of Expenditure has issued a memorandum for all government offices in Delhi/NCR to switch to electric vehicles. The move will reduce the dependence on oil imports and promote power capacity in the country. The switch to electric mobility will also help reduce GHG emissions from the transport sector. The release from the government further stated that EESL has received an encouraging response from the Central Government department across states. Agreements and MoUs have been signed with Central and State Government departments in Delhi, Maharashtra, Andhra Pradesh, Andaman & Nicobar Administration and Telangana. The energy body is also negotiating with other state governments across the country. Furthermore, the inclusion of CCS and CHAdeMO under charging infra standards is expected to encourage automakers to introduce more electric vehicles in the market. The government plans to replace its 500,000 conventional internal combustion engine (ICE) cars with electric vehicles, while EESL will establish charging infrastructure across states where EVs are being deployed.